You guys know I knit, right? I'm not going to post pictures of those, because I have a thing about jinxing projects in progress. 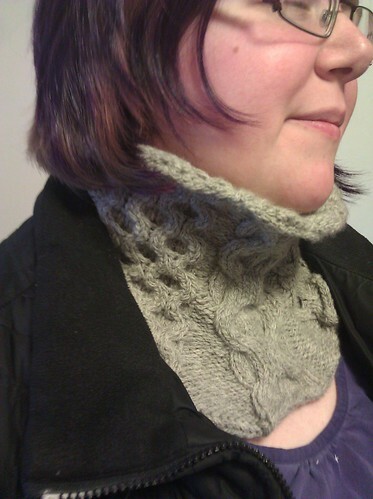 But a couple of weeks ago, I snuck a third project in: a snuggly winter cowl. I improvised the pattern, using a couple of cable motifs from a stitch dictionary along with some quick back-of-the-envelope math to figure out how to put everything together. That kind of crafty engineering is so satisfying for me--there's something deeply rewarding about taking some pretty materials and ideas and convincing them to become a Nifty Thing. And on top of that, I'm really happy with how it turned out. Winter's taken ages to get here, but it's finally reliably below freezing, and the extra warmth around the collar of my coat is definitely welcome.